The Galv-A-Dock Aluminum Base Plate is 10″ in diameter and recommended for soft ground conditions. 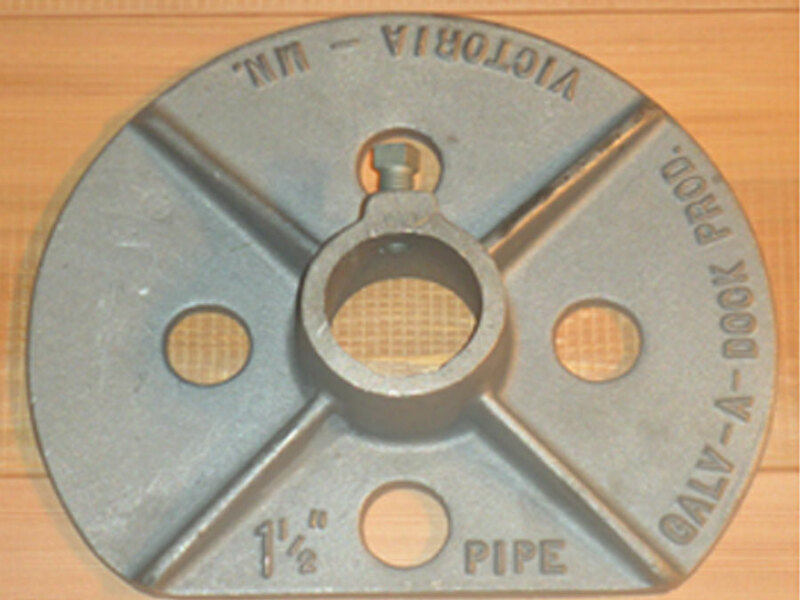 The plate telescopes up the pipe, allowing additional pipe length to protrude into the ground for added stability. The base plate ensures the dock does not settle under extreme weight or too soft of ground conditions. The Galv-A-Dock Side Sway Stabilizer is recommended in areas where the water is at least six feet deep with no L Segments or boathouses attached to the main walkway of the dock. Additional side sway stabilizers are added when large wide body cruisers are moored in a slip exposed to the west, north or northwest winds. The 30-degree stabilizer semi-vertical pipe is driven into the lake bottom, unless the ground is too soft. A second bracket is added at ground level for connecting the 30-degree stabilizer pipe to the vertical pipe for adequate side sway stabilization.